Arnt Jensen, the founder of Playdead – the team behind Limbo and Inside – has confirmed that the studio’s next title will be a “sci-fi game.” He has also said that Playdead currently has 40 members of staff. This news comes from an interview that Jensen had with Danish website ComputerWorld. Jensen goes on to describe his journey into game development as well as his experiences working as lead creative on Limbo and Inside. Unfortunately, the interview is in Danish and so we have to rely on how Google translates it, but it’s clear that his next project will be sci-fi based. The full translated quote reads: “The next game becomes a fairly lonely sci-fi game somewhere in the universe.” You can read the rest of the interview over on ComputerWorld. We’ve already seen hints of Playdead’s next project through two art teasers that the studio tweeted out. Back in 2017, Playdead tweeted a picture of a figure in a space suit dragging a mysterious object while a burning meteorite blazed across the sky. 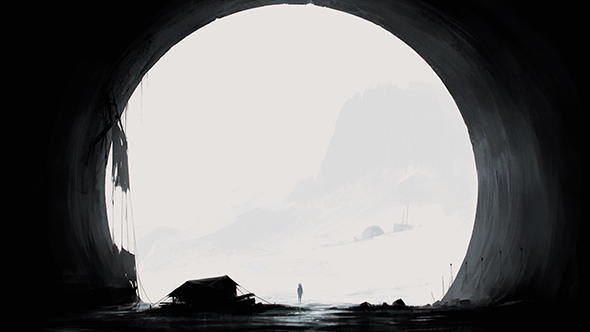 In another tweet from March this year more art was teased, which featured a lonely figure in a vast tunnel looking out into a snowstorm at the base of an icy mountain. Looks like Playdead will once again have you play as a character in a desolate and dangerous place. The Danish studio is known to make dark games, with both Inside and Limbo being stalwarts of the style – puzzle platformers with bleak, heavy atmospheres. These art teasers fit in with the vibes of their previous games so if you dig them you should certainly be looking forward to this next title.